Probably keeping the Silver Mink girl. For the right person, I may let her go. Snow kittens below are 9 weeks old. They will be ready to go in a few weeks. Super friendly, super healthy. Love them all. Kept the 4th girl and oh was it a hard choice!!! Mink female #1 (was blue collar) available. NOW SOLD Brown male. 9 weeks old. Parents are brown x Silver Mink. He will get more golden, but will always be lighter. NOW SOLD "Blonde" girl. 9 weeks old. I call her "blondie". Will get more golden as she matures. Still has fuzzies now too. Below litter: snows are reserved. TICA "Finding the perfect kitten"
​Contact me to reserve your kitten today. In addition to the kittens above, there may be more kittens which are not yet photographed, so please contact us for more information if you are looking for something specific. If you see a kitten that you like, contact us and we will give you more information. All buyers are required to sign a pet contract and place a deposit at the time of purchase. Good Bengals are not inexpensive; you generally get what you pay for! 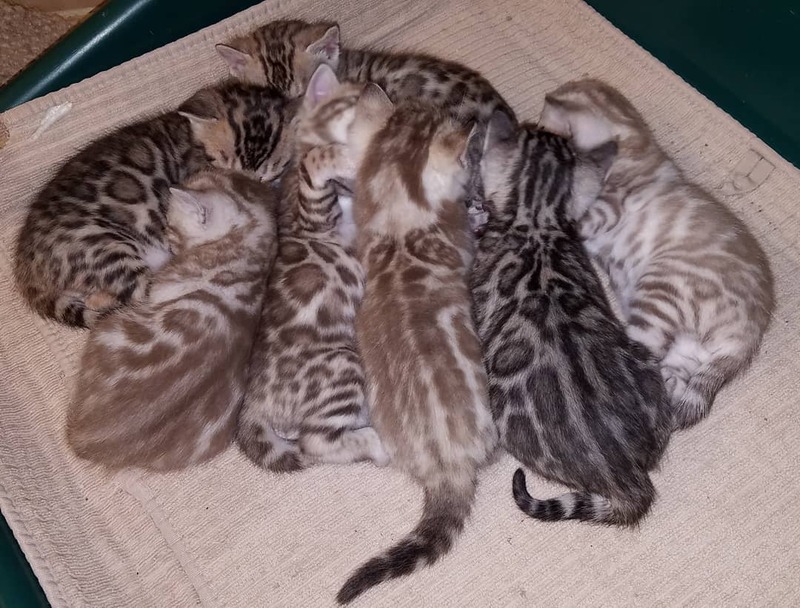 It is true, you can find inexpensive Bengal kittens, but in most cases, these will not have the bright colors and vivid markings that you see on Bengals pictured on websites and in magazines. There is a heavy expense of time and money involved in raising health tested quality kittens, more than most people realize. 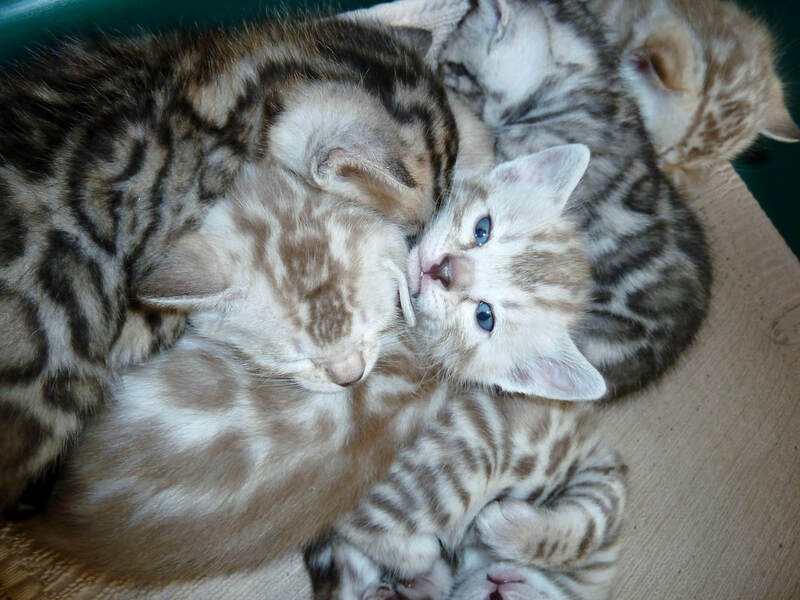 All kittens will possess large open tri-colored rosettes. Pet prices start at $2000 depending on type, color and complexity of pattern (rosettes). Send me an email if you would like to be added to the waiting list (deposit with contract required). Everyone loves to see pictures of their new kitten, but not many people realize how difficult it is to get good pictures of active kittens. 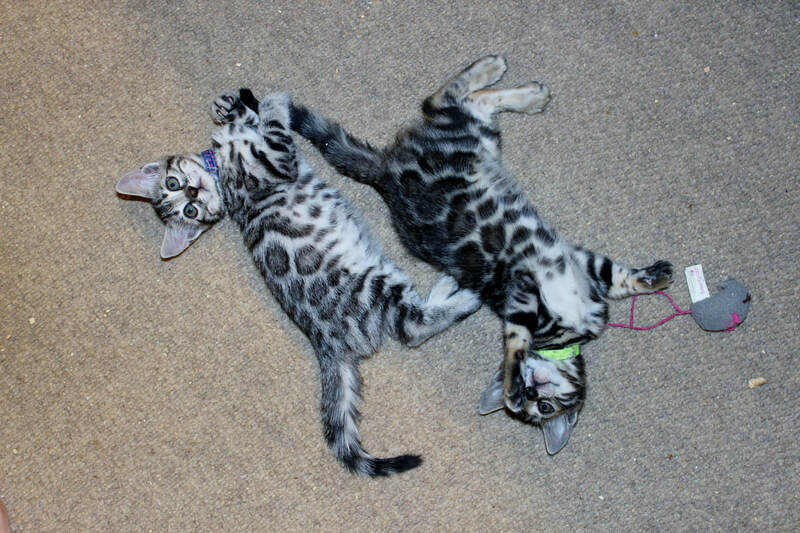 It takes a great deal of patience for the perfect pose and lively kittens are not keen on posing. Initial pictures will be taken between 3 to 4 weeks, but after 5 weeks the kittens start getting fuzzy. We will make every effort to send new pictures of your kitten before the kitten is ready to go home, but time prevents us from continually taking pictures of kittens as they grow, hopefully you will understand. If you are picking up your new kitten, we generally release kittens by 10 - 12 weeks of age as long as they are 3 lbs. At this time, they will have had 1st vaccines, de-worming, are eating well on their own and using the litter box. If shipping is required, we only ship within the United States, shipping expenses are extra and are not included in quoted prices of the kittens. Our kittens are guaranteed healthy on arrival but we do require that you have your new kitten checked by your veterinarian within 72 hours of arrival.